IILP is different. Whether you have been involved in efforts to diversify the legal profession for years or are new to the endeavor, you’ll find that IILP’s approach is different from the familiar and traditional diversity efforts lawyers, judges and law students have come to expect. We seek real change, now, and offer a new model to achieve it. IILP takes a real-world, common-sense approach that aims to acknowledge, understand, and address the reality of diversity in today’s legal profession. As lawyers our training makes us more comfortable organizing concepts into categories and compartments. IILP seeks to move outside this comfort zone and push for change by focusing on the “pipeline” or supply side” in conjunction with (and support of) the more traditional emphasis on the “demand side”, i.e., corporate clients using their economic power in selecting firms to encourage diversity. IILP talks about what others don’t want to. We talk about what is really on people’s minds, no matter how sensitive the issues. We appreciate the need for tactfulness, but also know that other less ”politically-correct” perspectives may be valid and important and must also be addressed. We don’t stifle discussion. Rather, we encourage it, even if it’s about IILP’s own efforts. Does diversity threaten the position of white males? Are we unfairly favoring some over others? How prevalent is the view that diverse lawyers are less able to thrive in large firm environments or corporate practices? Is there a conscious or subconscious avoidance of minority- and women-owned firms? Are traditional corporate diversity pledges undercutting law firm effectiveness by dictating to outside counsel who can handle matters, perhaps against the best judgment of the law firm? Do we do a disservice to diverse students by encouraging them to incur huge debts to enter a profession that needs them yet remains so inhospitable as to make their retention unlikely? Are diverse associates in law firms receiving the same quantity and quality of assignments, professional development training and opportunities, mentoring, and client contact and exposure as other associates in their law firms? How do corporations and law firms show their commitment to diversity and inclusion? Is it a “check-the-box” or “write-a-check” exercise? Do corporations put “teeth” behind their commitment to diversity? How innovative are law firms willing to be to meet their diversity and inclusion goals and objectives? IILP gets the data. We move beyond the anecdotal. It’s not enough that everyone knows or accepts certain facts. We test the facts, measure them and report them. How much diversity is there among the equity partners of the Am Law 200 law firms? How much business are corporate clients actually giving to diverse lawyers? Are all types of diversity needs receiving adequate attention? What are the sources of stress and tension among diverse lawyers? IILP invents and tests methodologies that will lead to change. The legal profession has not made the kind of progress in diversity and inclusion that it should. Continuing to follow the same strategies or to do more of the same types of programs while expecting different and better results wastes everyone’s time, energy and resources. We develop and present new strategies like IILP’s Professionalism in Practice program and the Pledge to the Profession. We pursue new methods to educate and inspire the legal profession about diversity and inclusion like IILP Review and the State of Diversity and Inclusion in the Profession Symposia. We promote new tactics to create more opportunities and build greater diversity and success by promoting promising endeavors like Rules of the Game 2.0. There is skepticism, and perhaps even cynicism among some, about the prospects for increasing diversity and inclusion in the legal profession. We acknowledge that and understand why it is so. Regrettably, the history of our profession is filled with instances of discrimination and prejudice against diverse individuals. These range from denying admission to the bar to revoking or refusing bar association membership to discriminating in hiring and in judicial appointments, nominations, and confirmations to discriminatory court rulings. IILP starts from the premise that yesterday’s practices have shaped today’s profession. Becoming a lawyer requires educational achievement. For a variety of reasons, some people do better in school than others. If the group that does better in school is comprised disproportionately of individuals from certain groups, this achievement gap, whether real or perceived, affects the diversity of the pool of future candidates who will enter and graduate from law school. If those entering law school are a relatively homogenous group, the pool of lawyers graduating and taking the bar will not be more diverse. A smaller pool of law students who are diverse, of necessity, results in a less diverse legal profession. “No one looks like me” phenomenon and lack of “critical mass”: Imagine spending 10 hours a day, 5 to 6 days a week, in an environment where no one else looks like you, shares your culture, humor or food preferences, understands your religion, appreciates your family’s values, or lives in the community where you live. It can make for a weary and isolating existence. Is it any wonder that some lawyers who are diverse will opt out and seek other places of employment? Statistical improbability of changing economic ownership: Consider the number of law school graduates who enter Am Law 200 law firms, then calculate the small number who remain until partnership decisions are made and the even smaller number who actually make partner. Your math should show you that this funnels down to such a small number that the composition of equity ownership will not change without market innovation. Indeed, given the number of equity partners in the Am Law 200, raising the number of equity partners who are diverse so as to yield a materially different percentage is almost statistically impossible. Lack of transition opportunities moving from the government to the private sector: While the government has always been a source of lateral equity partners for large law firms, it remains questionable whether diverse government lawyers have the same opportunities to transition into the private sector. Within law firms, it is not uncommon for diverse lawyers to find that they are particularly lacking when it comes to visibility within the firm and access to leadership, business, and opportunities. From the law firm perspective, too often the effort by clients to emphasize diversity is piecemeal and lacks consistency. Law firms often find it easier to emphasize recruiting over retaining diverse lawyers. And, it is not uncommon for a firm to have a few diversity “stars” at the expense of all the other diverse lawyers at the firm. Much of the impetus behind the legal profession’s diversity and inclusion efforts has come from corporate clients. When corporate clients are interested in and committed to these efforts, much can be accomplished. Yet, even the most interested and committed corporate clients face internal challenges to their diversity goals. It can be extra work to train any new firm, but this comment overlooks the fact that many minority- and women-owned law firms are comprised of lawyers who were trained in large law firms and have experience working on matters for large corporate clients. All kinds of lawyers can fail to meet expectations. Just because one diverse lawyer did not work out does not mean that others won’t. Diverse lawyers can be contacted through a number of directories. Minority, women, GLBT and disability bar associations, both national and local, are also a resource to find diverse lawyers who have special expertise in the type of matter you need handled. You can also contact corporate counsel in other companies for recommendations. Finally, numerous diversity bar programs or conventions provide ample opportunities to meet talented diverse lawyers. Our leaders are personally devoted to diversity and inclusion in the legal profession. Each is engaged full-time or devotes a meaningful amount of time to diversity and inclusion and to IILP. For example, with over 25 years of experience, Sharon Jones has earned a reputation as one of the most effective diversity consultants in the U.S. and abroad. Professor Elizabeth Chambliss is one of the foremost authorities on diversity and inclusion statistical data and research. Dr. Sandra Madrid is one of the nation’s leading experts on law school admissions issues. Marci Rubin leads the most successful business development program for minority lawyers, the California Minority Counsel Program. Lawrence Baca spent 32 years at the U.S. Department of Justice Civil Rights Division including a four year detail as Deputy Director of the Department’s Office of Tribal Justice and is one of the best known experts in federal Indian Law. Sally Olson and Leslie Richards-Yellen are partners responsible for their respective law firms’ diversity and inclusion efforts. Terry Murphy and Annette Hudson-Clay have guided their respective bar associations’ diversity efforts, making them two of the more successful bar associations. John Mathias has been leading the American Bar Association Section of Litigation’s Judicial Internship Opportunities Program and Martin Greene is one of the country’s best known advocates for minority-owned law firms. Read more about our Board Members and Advisory Board Members. We start with the “pipeline” . . .
Much of the emphasis on diversity and inclusion has tended to focus on the “demand side” – corporate clients using the assignment (or withdrawal) of their business to encourage outside counsel to be more diverse. We fully support such efforts. But IILP’s focus goes beyond that: We look at the pipeline – helping diverse students become law students, enter the legal profession and eventually become successful lawyers and judges – and the profession that awaits. As part of our mission, we want to make sure that the profession that awaits them genuinely offers a career path for long-term professional satisfaction. Starting with the pipeline without limiting ourselves to it is an important distinction. Corporate clients can urge, beg, cajole, threaten, or even demand more diversity among their outside counsel, but if the pool of diverse lawyers is insufficient, none of that will make much of a difference. But we also recognize that the diverse lawyers who are already part of our profession are subjected to professional barriers and obstacles others do not encounter. Until we, as a profession, acknowledge and address those challenges, pipeline efforts alone will solve very little. Hence, while IILP supports and intends to complement corporations’ “demand-side” efforts by increasing the pool of diverse law students and lawyers to the benefit of the entire legal profession, we do not have limit the IILP to a “supply and demand” paradigm. For example, IILP’s Pledge to the Profession project, which is aimed at encouraging more lawyers to get involved in pipeline efforts. IILP also looks at the differences (or not) among the groups in terms of the challenges faced in different sectors of the legal profession. 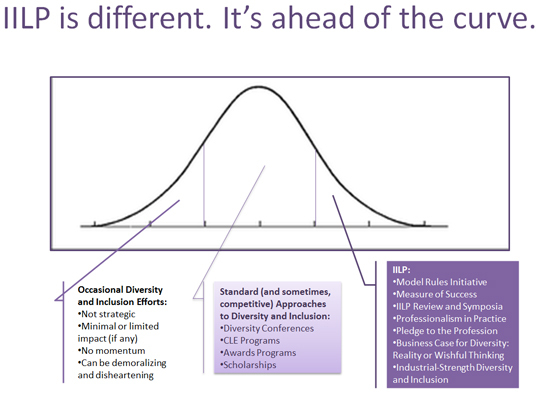 IILP researches the issues necessary to move the diversity and inclusion “needle” forward by providing the documentation to support or disprove theories and assumptions with measurable data about the profession’s progress or lack thereof. IILP works to provide innovative forums that we call “Open Talk/Real Change” for discussion and learning that moves beyond the standard conference or meeting. Our educational programming brings together cutting edge thinkers and thought leaders with real world practitioners, and, through tools designed to elicit frank and candid discussion on differing points of view, seeks to forge consensus with action. IILP tries to foster conversation that moves beyond preaching to a choir of like-minded and sympathetic individuals. It aims to bring together different views and experiences to facilitate real learning and informed action. We promote unsanitized dialogue about diversity, inclusion and our profession. IILP is a national organization that relishes the opportunity to collaborate with and support the work of local and regional organizations. If our mission to increase diversity and inclusion within the legal profession is to have any chance of success, it is crucial that we engaged with those organizations that know their own communities best in this endeavor. If you are a local organization that would like to collaborate with us, we welcome the opportunity! IILP was incorporated in September, 2009; and we opened our office on December 1, 2009. With the conclusion of our first full year of operations, it is appropriate that we report on our progress and activities. January 2010 IILP Board convenes its first meeting. February 2010 IILP and Harvard Law School’s Negotiation and Mediation Clinical Program agree to undertake a joint research project to study how law firms communicate internally on sensitive subjects such as perceptions of bias. March 2010 IILP and the Chicago Bar Association present “Professionalism in Practice,” a two-day program that brought together law students, young lawyers and judges to explore the concept of professionalism through a lens of diversity and inclusion. Thirty law students from five law schools, twelve judges, and fifteen young lawyers participated. The participants learn how different experiences can color one’s perceptions about what is or is not professional and how to better work across lines of difference. May 2010 IILP’s website goes live. June 2010 IILP holds a launch event at Kraft Foods’ headquarters in Northfield, IL. August 2010 IILP launches its Pledge to the Profession pipeline project during a reception hosted by Del Monte at its headquarters in San Francisco, CA. The Pledge to the Profession encourages lawyers to make a commitment to dedicate the equivalent of one day (or eight hours) to working with an existing pipeline program. IILP also launches its Business Case for Diversity Research Project. September 2010 IILP and Harvard Law School’s Negotiation and Mediation Clinical Program research project begins. IILP makes a presentation about its work to the Coalition of Women’s Initiatives in Law Firms. IILP participates in the California Minority Counsel Program’s annual business development conference. October 2010 IILP’s Advisory Board convenes its first bi-monthly meeting. IILP starts its Partners and Allies program, creating a “seal” for each level of support. November 2010 IILP participates in the American Bar Association Section of International Law’s program on “Diversity, Equality and Inclusion for the International Lawyer” in Paris, France. IILP also participates in programming at the National Asian Pacific American Bar Association Convention in Los Angeles, CA. December 2010 IILP holds a reception hosted by Skadden Arps Slate Meagher & Flom to introduce itself to the New York legal community. Later that month, IILP collaborates with the Harvard Law School Negotiation and Mediation Clinical Program, the Chicago Committee on Minorities in Large Law Firms, the Harvard Law School Association and the Harvard Law Society of Illinois to arrange a presentation of their joint research findings on Law Firm Diversity & Inclusion Communication Practices. The program, followed by a reception, is hosted by Kaye Scholer at its Chicago office. IILP published its first research report, “The Business Case for Diversity: Reality or Wishful Thinking?” This report gave the legal profession its first measurable data on the impact and effect that the business case for diversity was having upon its diversity and inclusion efforts. IILP published its first, “IILP Review: The State of Diversity and Inclusion in the Legal Profession” and presented six symposia based upon the report in Chicago, Houston, New York, San Francisco, Seattle and Washington, D.C. IILP also began a partnership with Harvard Law School’s Negotiation and Mediation Clinic to confidentially study how law firms and their lawyers communicate internally about sensitive topics such as perceptions of bias. IILP launched programs: “Women and Minorities: Willing Partners or Reluctant Allies?” in partnership with the National Association of Women Lawyers, and “Candid Conversations". IILP also joined forces with Law Preview to begin offering scholarships for law school preparatory programs to five students accepted by Loyola University of Chicago Law School. IILP launched its Model Rules Initiative where it began a campaign to encourage the American Bar Association to amend the Model Rules of Professional Conduct to include a section under which efforts to increase diversity and inclusion in the legal profession would become a matter of ethics and professional conduct. IILP began to implement plans to establish itself as a charitable organization in the UK. IILP presented its first UK/US inclusion programs. IILP published its Hurricane Sandy-delayed 2012 Review on the State of Diversity and Inclusion in the Legal Profession and presented eight symposia based upon the new report in Chicago, Dallas, Houston, Los Angeles, New York, San Diego (2014), Seattle and Washington, D.C. IILP held its first fundraising event, “The Ethics of Diversity and the Politics of Inclusion” in Chicago and New York. IILP, with support from a number of British lawyers groups in the UK, presented a program on bias about skin color and its implications for diversity and inclusion efforts within the US and UK. An additional symposium on the state of diversity and inclusion in the US was presented in San Diego. IILP continues to present programs in the US and the UK and to speak at and support the programmatic efforts of other organizations as well. The 2014 Review on the State of Diversity and Inclusion in the Legal Profession was published, including not only US perspectives on diversity and inclusion but British ones as well! IILP collaborated with the Chicago Bar Association, the National LGBT Bar Association, and the InterLaw Diversity Forum to present a program on LGBT Diversity Issues for Lawyers in the US and the UK. IILP also participated in a program on women’s issues with the Center on Women in Law at the National Asian Pacific American Bar Association. IILP joined with NAMWOLF to present programming examining the impact of corporate preferred provider programs on minority- and women-owned law firms. IILP participated in a range of programs with other organizations such as Ms. JD, the National Pre-Law Diversity Conference, the ABA Section of Business Law, the Association of Legal Administrators, and the ABA General Practice Solo and Small Firm Division. To top the year off we also presented more Symposia on the State of Diversity and Inclusion in the Legal Profession in eight different cities. In 2016, IILP, along with the Chicago Bar Association, presented the first conference discussing diversity and inclusion issues for the legal profession in Europe in Lausanne, Switzerland at the headquarters of Philip Morris International. IILP also began collaborating with the ABA Law Practice Division to support its Talk2Ten online mentoring program for law students, something that we continue to do today. 2016 also marked our first programmatic foray into the intersection of ethics and diversity. “The Ethics of Diversity and the Economics of Inclusion” brought together panels of corporate and law firm leaders to discuss the legal profession’s ethical obligations to become more diverse and inclusive. 2017 saw IILP publish a three-part series of papers, “Competing Interests,” in which we examined the previously unrecognized relationship between the declining numbers of African American and other diverse partners in law firms and corporate convergence or preferred provider programs. IILP published a new IILP Review on the State of Diversity and Inclusion in the Legal Profession and produced Symposia, based upon the new Review, in 7 cities across the US. 2017 also saw the launch of IILP’s Social Impact Incubator. We joined with the National Association for Attorneys with Disabilities, the Chicago Bar Association, and the ABA Law Practice Division to present Access Success, a program and job fair for attorneys with disabilities. IILP began to expand its focus and work to include more solo and small firm lawyers in the profession’s diversity and inclusion efforts. IILP also launched its blog, “Inclusion at Work,” and began laying the groundwork for a variety of videos capturing our programs and work. After focusing much of its initial global diversity and inclusion work on Europe, IILP, in partnership with the New York City Bar Association and the Vance Center for International Justice, convened the first conference ever dedicated to issues of diversity and inclusion in the legal profession in Latin America. Check out the slideshow below to see more 2017 highlights! In 2018, IILP continued to present its increasingly popular Symposia on the State of Diversity and Inclusion in the Legal Profession, this time in the Twin Cities, Charlotte, Boston, Columbus, and Chicago. We also saw a growing number of requests for IILP’s perspective and participation in diversity and inclusion programming around the country, including the ABA Tort Trial and Insurance Practice Section; the American Immigration Lawyers Association; more local bar association conferences; and another presentation of Access Success. Our Social Impact Incubator members began taking on more public speaking opportunities and IILP continued its programming for global law firms and corporate law departments with two programs in London and a day long strategy session for European lawyers in Brussels. Publication of IILP Review: The State of Diversity and Inclusion in the Legal Profession, this is set to be published in the first quarter of 2019! Presentation of Symposia on The State of Diversity and Inclusion in the Legal Profession. Want IILP to come to your city? Contact Jenna Meyers if you're interested in hosting a Symposia. We celebrate our 10th year! Stay tuned for exciting anniversary events and research. Do you subscribe to our emails? Sign up here to stay in the loop about our Symposia, conferences, and Review. We invite you to join with us in these efforts and welcome your participation, involvement and leadership.